International Journal of Chemistry and Aquatic Sciences (IJCA) is a double-blind peer-reviewed open access journal published under the brand KY Publications. 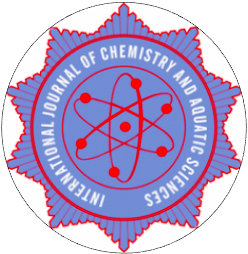 The journal is an international journal that publishes original research articles, short communications, and review articles in a broad range of areas relevant to all aspects of Chemistry, aquatic sciences (freshwater and marine waters). The Journal specifically strives to increase the knowledge of most aspects of applied researches in both Chemistry and cultivated, wild aquatic animals in the world. It provides an academic platform for professionals and researchers to contribute innovative work in the field. a). Upon receipt of paper submission, the Editor sends an E-mail of confirmation to the corresponding author within 48 hours. If you fail to receive this confirmation, your submission/e-mail may be missed. Please contact the Editor in time for that. b). Peer review. We use double-blind system for peer-review; both reviewers and authors’ identities remain anonymous. The paper will be peer-reviewed by three experts; two reviewers from outside and one editor from the journal typically involve in reviewing a submission. The review process may take 1-2 weeks. NOTE: The publisher and journal have a policy of “Zero Tolerance on the Plagiarism”. We check the plagiarism issue through two methods: reviewer check and plagiarism prevention tool.